One of the best-loved and most quoted stories of “the man who invented Christmas”—English writer Charles Dickens—A Christmas Carol debuted in 1843 and has touched millions of hearts since. Cruel miser Ebeneezer Scrooge has never met a shilling he doesn’t like…and hardly a man he does. And he hates Christmas most of all. When Scrooge is visited by his old partner, Jacob Marley, and the ghosts of Christmas Past, Christmas Present, and Christmas Yet to Come, he learns eternal lessons of charity, kindness, and goodwill. Experience a true Victorian Christmas! To quickly summarize, A Christmas Carol is a story of an old miserable man named Ebeneezer Scrooge, who on a Christmas Eve is visited by the ghost of his former partner, as well as the ghosts of Christmas Past, Christmas Present, and Christmas Yet To Come. Through these visits Scrooge sees how his cold-hearted behaviour has affected others around him. The short book constructs the idea of an Christmas as a time of goodwill, charity and kindness. I began reading A Christmas Carol on Christmas Eve and finished it on Christmas Day. It has been a couple of years since I last read it, and with every read I discover new things. Because the book is only slightly over 100 pages, Dickens doesn’t go as deeply into developing some of the side characters or side plots as in his other works. However, the imagery is still there as well as the setting of Victorian London. Because there are so many adaptations, almost everyone knows how the story goes, but I’d still recommend that you read it for the little nuances that are often left out of the adaptations. 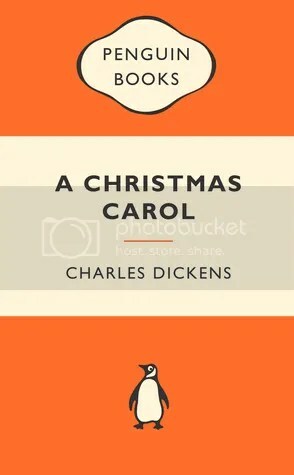 A classic for the holiday season, A Christmas Carol is a short and relatively easy to read, which is why I’d definitely recommend it to people who are hesitating to picking up Dickens’ larger works. Mind! I don’t mean to say that, of my own knowledge, what there is particularly dead about a doornail. I might have been inclined, myself, to regard a coffin-nail as the deadest piece of ironmongery in the trade. But the wisdom of our ancestors is in the simile; and my unhallowed hands shall not disturb it, or the Country’s done for. You will therefore permit me to repeat, emphatically, that Marley was as dead as a doornail. This entry was posted in Book reviews and tagged A Christmas Carol, book review, Charles Dickens, classics, TBR 274 by Noora. Bookmark the permalink. I think I might pick this one. By the way,if you’re interested in Dickens,go to thebookpeople and check out the offer on the Dickens collection.They’re all in Vintage editions,and I’d have bought them had I not been this skeptic about his works. You’ll also see other great offers on Hemingway books!